If getting your reps up is the goal, then act like it! Dive into this pull-up-specialization program and expect to see your numbers skyrocket. Yes, it works for other bodyweight moves, too. So, you want to do more pull-ups? Then do pull-ups more often. That's the one-sentence answer. Doing them once a week for the same old sets and reps isn't going to pay off in big totals. Want a longer answer? Do what Major Charles Lewis Armstrong did. He was a Marine, karate champion, marathon runner, and on two separate occasions set the world record for most pull-ups in a single session, performing 1,435 repetitions in under five hours. But the routine he used isn't just for people who want to set world records. I used it to smash through my personal bests in both muscle-ups and pull-ups. If you can't do more than a couple reps right now, then this plan probably isn't for you—yet. But if you can do a few and are ready to get serious about the bar, get ready to learn from the guy who was the very best. This is definitely a specialized pull-up program. It's a five-day-a-week program, and I recommend sticking with it for 5-6 weeks. You can pick whichever five days a week you like, but make sure they're consecutive. Then, take two days off and do it again. Armstrong did this program Monday through Friday, then took weekends off. But he didn't only do pull-ups. Each morning, he would perform 3 sets of max normal-style push-ups. This was to keep a balance for his pushing muscles (chest, triceps). This program focuses on your pulling muscles (biceps and back). Each set has a rest period of 5-10 minutes. Other than that, it's a whole lot of pull-ups. But to be clear, these pull-ups are done only with perfect form. That means you should go through the full range of motion, with momentum generated from swinging or kicking, and don't thrust your chin over the bar. Keep everything nice and controlled, and when you can't do another rep perfectly, stop the set right there. Note: Pick a number of repetitions that will allow you to reach 9 sets with 60 seconds of rest between each set. For example, let's say you picked 9 sets of 6 reps. If you can't reach 9 sets, that means the number you picked was too hard. If you cruise through all 9 sets, that means the number you picked was too easy. This will take some experimenting. Note: This is a repeat of Day 3, but instead of stopping at 9, do as many training sets as you can. Consider it a test to see if you should increase your reps per training set. If yesterday was relatively easy, add 1 rep to each set. If you make it through all 9 sets, then the following week, add another rep and use this new number to reach your 9 sets. Today, you will repeat the most difficult day of the week, or perform weighted pull-ups. The routine on this day should change regularly to keep your body guessing. You can use this basic framework to boost your numbers on any bodyweight movement you do for reps, such as dips, push-ups, and muscle-ups. Some days will take a bit of tweaking, though. For example, on the training-set days, you would do standard-width muscle-ups, then close-grip muscle-ups, then a slightly wide grip. Give this program a serious run, and you will see your numbers go up. Let me know how it works for you! Barstarzz just launched its BTX 2.0 transformation program. Visit barstarzzbtx.passion.io/access to get more info and sign up! 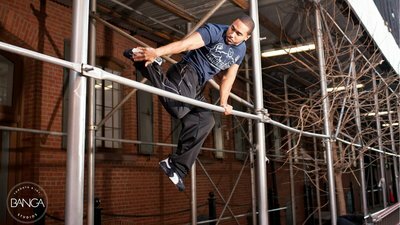 Eduard Checo is the founder and CEO of BarStarzz, a fun, innovative exercise movement using freestyle calisthenics and bodyweight exercises.